Dien Bien (VNA) – Floods triggered by heavy rains on August 15 and 16 caused a nine-year-old girl to go missing and damaged roads and houses in the northern mountainous province of Dien Bien, added to the losses caused by floods early this month. Initial statistics from the provincial steering committee for natural disaster prevention and control also showed two were injured by landslides and property damage was estimated by more than 2.4 billion VND. Several key roads in Dien Bien were blocked by landslides, and 23 families had to evacuate from their houses. 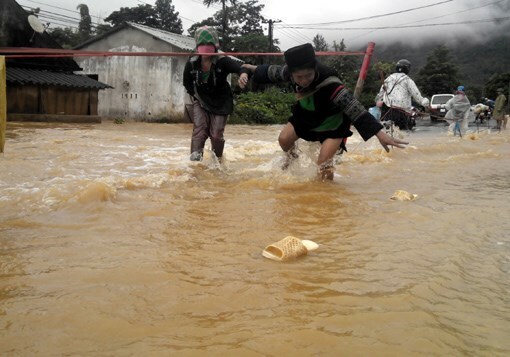 Torrential rains also caused streams in Son La northern province to swell, hindering efforts to transport relief goods to victims of the previous flash floods, particularly in Muong La district. Heavy rains and flash floods in early August took the lives of 26 people and left 15 others missing and 27 injured in northern mountainous provinces, mostly Yen Bai, Son La, Lai Chau, Dien Bien and Cao Bang, according to the Central Steering Committee for Natural Disaster Prevention and Control. Torrential rains and floods also swept away and destroyed 231 houses, damaged 245 others, submerged 338.5 hectares of rice, and forced 398 households to leave their homes.